Whats Included with my Admission? A FREE Hayride, FREE Magic Show, FREE Chicken Show, FREE Face Painting, FREE Cow Train Ride, FREE contests including Scarecrow making, Mummy Wrapping, Pumpkin Decorating and Pie Eating as well as the event and entertainment included on the weekend(s) that you are here! You will also get coupons for other attractions including: $1.00 off Panning for Gems, $1.00 off Pumpkin Sling Shots, $1.00 the Zombie Train, $1.00 off the Cornmaze, $1.00 off the Jumping Pillows and $1.00 off the Boo Barn. Do we have ATM's available? Is Friday considered part of the weekend? Can we pick our own pumpkins from a pumpkin patch? What is the age limit to pay admission? Do I have to pay admission if I am just coming to buy pumpkins or shop in the store? When is wristband day for the rides? Do we have Pony Rides here? Do we have food vendors open during the week? What's included with my admission? Are we open on Columbus Day? WHAT HAPPENS IF IT RAINS OR WE HAVE BAD WEATHER? 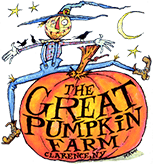 If you still have questions you can either call us at 716.759.1929 or email us at info@greatpumpkinfarm.com or check this website for the information you need - the answers are here!